When last did you see him before he allegedly went missing? I saw him last in September last year and that was in Abeokuta during the book launch by my cousin. I also saw him when the father called me for us all to make peace. But, up till today, nobody knows where he is. Up till now, he’s still in hiding. The statement that was released was not by my son. The father could have written it in his name. He’s still running away from the wife and his father. They should let him come out to say what he’s going through but Chief Olusegun Obasanjo doesn’t want the whole world to know the marriage is not working because of his big name and status. As I speak to you, he’s still in hiding. The marriage is no more there. There is no truth in that statement, and my son can never tell me I’m an attention-seeking woman. He couldn’t have said that. Ask those who wrote the story whether they saw him in person or whether he handed the statement to them directly. If the marriage is intact, why has my son not been seen since November 1, 2017, and no one cares about his safety or his life. If he comes out, people will hear the absolute truth from him. Are you close to him, because one would expect you would be one of the first persons to know? I can’t say we are very close. You know men like to be on their own. I would say he’s closer to the father than me because he lived there. The father brought him back from England and he started living with him. He read International Relations in England and he said he preferred to stay there but his father wanted him to come back. So, on return, he has been with the father. When did you hear about his sudden disappearance? It was from the wife I got the news and that was December 2017. People started calling me to say my son was missing, because I don’t live with them. I live in Lagos while they live in Abeokuta, and I said to myself that they had started again. In fact, it was one of his dad’s wives that alerted me to the ill-treatment my son was going through and she was surprised that my son didn’t mention what had been happening to me. His wife doesn’t call me, but I had to call her to ask and she told me it was true. Was that not the first time he would leave his matrimonial home? I can count like three times, before this last one. I don’t live with them so I don’t know his movement, but from what I gathered, they were always quarrelling and fighting. I mean very big fight. My son is a quiet, peaceful person who is not confrontational. He’s not violent, but when the heat became too much, he would leave the house for her. Then, they would start looking for him; the father would fish him out and commandeer him back to the house, because he works with the father and he lives there too. Anytime it happens like that, his wife and others, who don’t call me ordinarily, would start calling me, and usually that was how I got to know he had left the house again. But in this particular case, he left since November 1, 2017. This is February and my son is yet to be found, yet, people are saying I should not be worried. When you spoke with his wife, did she say there was a quarrel before he left the house? She would not talk, maybe she sees me as nobody. She would not want to tell me anything and she doesn’t see me as a friend. Since they got married, even before then, she and her husband weren’t calling me, but from what I gathered, not even from my son because he’s not very close to me, but when I started asking around, that was when I knew that there was a huge problem on ground, which I wasn’t aware of. You know I made a lot of noise before the wedding. What was the noise about? Implement the instruction given by the Almighty God. Were you the one God spoke to or was it a prophet that told you? I’m an evangelist but the message given to me was not made up by me. It was given independently by somebody who didn’t even know that anything would ever come up. The prophecy came long before even this lady (his wife) came on the scene. She was introduced to my son by my twin brother (Kenny Martins), which is a good thing. My twin brother is very close to Daddy Kessington Adebutu and Kenny meant well. He didn’t mean any harm. After the wedding, people privy to their marriage told me about the horrible things this girl had been doing to my son. Every little argument, she would slap the young man, grab his shirt, insult and humiliate him. When it gets too much, he would run out of the house and they would start looking for him everywhere. This woman they married for my son has completely stripped him of all dignity. Since you and your son had not been very close, did he report to anyone? I understand that the young man reported to the father all that had been happening, but nothing was done. The humiliation and threats this man suffers is much. By African culture, the man is the head of the family. And if you look at the two fathers, the two of them are polygamous but no wife controls them. Sir Adebutu is still with the first wife and she doesn’t give him problems; he manages his family, and daddy Obasanjo also has wives and not all his wives are with him, but why is he now forcing my son to stay married to this lady. Are you saying it is the former President that is forcing your son to remain in the marriage? He is, because that girl threatened that she would deal with my son. My son has political interest but I learnt she’s already going round, telling people that my son beats her, whereas she’s the one slapping him. Since you don’t live with them, you can’t be sure she said all those things. It is verified. That is why I have gone to the police to report. They should allow this man to come out and tell the whole world what he’s going through in the hands of this girl. He’s being treated like a houseboy by this woman; like a slave that was bought; telling the man she’s the best he could have and that he could not have any other woman like her. I told her before she married him that my son doesn’t have money and that he’s a salary earner, so she wouldn’t place too much hope or expectation in the name, and that he earns N100,000 in a month. Are you sure that is what he earns? I’m telling you that is what the man pays him, and he hands over the N100,000 to this lady every month but she said he had to be giving her N300,000. He said he didn’t have that. She said she didn’t know she married a poor man and it’s the name he has, he doesn’t have money. She wants N300,000 and she doesn’t cook, she doesn’t take care of her husband. She doesn’t care and she would be threatening him, which is most disturbing. The young man reports everything to the father, yet, the man says he should stay married to the girl. If the relationship is okay, why would a man be running away from his matrimonial home every time? Everybody supported the date the wedding held, except me, not that I didn’t support the wedding, but the day it held, and that was why I spoke out about it. If you marry a woman and you find succour, comfort and warmth, will you be running away? Since he went missing, allegedly, have you spoken with your husband, the former President, about the issue? He’s my ex-husband; that should be noted. We are no longer together, so I’m his ex-wife. To your question, we talk occasionally. Even after the wedding, he called me to come. I didn’t want to go but the spirit of God said I should go. I met him, and he and my two children apologised to me, so there could be peace. But there was problem after the reconciliation. I told daddy Obasanjo to also extend the reconciliation to his first wife, Iyabo’s mother, but he got angry. He abused me very well. Daddy Obj has many women and nobody forces him to live with any of them. No woman, no matter how troublesome, can force herself on him. He decides on whom he wants. We are separated but there is peace between us. We still talk and he’s still close to members of my family. So, we are not enemies. Do you have an idea of what your son wants? The only time I got through to him, God just made it possible, I told him to let us resolve this issue so people would not say your mother caused it. He said no, it was a matter between him and the girl. He said I should just go and help him beg Chief Adebutu that he was no longer interested. I told him to do it himself; he said he would not, because he didn’t want any form of reconciliation with the lady. He said I should go and beg him. I said what about his father? He said he had told him he was no longer interested in the marriage. He said he had told everybody that should know that he was no longer interested. He said there was a day he was on a call in the room and his wife came in. She didn’t know he was on the phone with my twin brother. He said she started slapping him, accusing him of talking to a woman. He said my twin brother overheard the altercation. How can a woman be beating a man? These allegations are hard to believe. Thank you. It is hard to believe, but it is true. He said the mother too used to call him to threaten him. People around them know these things. This is not marriage. Why should his father join forces with them? This is not hearsay. I heard it from people who were privy to it. They even told me that if I were to hear from my son, I wouldn’t be able to swallow it. How did you feel when you got this information, especially since you warned them earlier? When I heard all these things, I was sick for about three weeks. I thought to myself that can a human being be subjected to this kind of dehumanising treatment; stripped of his dignity? Now, a man who has more than one woman and cannot tolerate nonsense is forcing his son to stay in a marriage like that. Every day, it is threat and humiliation; verbal and physical assault. That was what I was told. I even asked why he couldn’t beat her back, and I was told that if he retaliates and she falls down, the story would change. It must be God that has been restraining him because if he had reacted to the things she does to him, the story would not be the same again. She might be in coma now or in the hospital. How old is he at the moment? Do you think all these things are happening because they didn’t heed your warning before the marriage? It wasn’t my warning. It came from God. But I wouldn’t know; the instruction came from the Almighty God. I didn’t go to beg for the instruction. I did not go to kneel down in front of anybody to say I wanted to know about my son. The instruction came free of charge from the Almighty God. There were signals and specific instructions that I don’t want to talk about. But for it not to happen, I was told to pray and I did. They did not heed the warning. With this latest development, have you and Chief Obasanjo sat down to discuss how to locate him? What do I want to discuss with this man? He sees himself as alpha and omega; you can’t talk to him. All he wants is for the young man to obey him, by staying in the marriage. If not, why would a man be calling people not to give him financial or business assistance? Are you sure he did that? Yes, he did. He said he would ensure that my son suffers if he does not stay in the marriage. But you said you still see and talk occasionally. I don’t feel like talking to him, because he and these two people have an agenda. What, in your view, is their agenda? The agenda is to turn my son into a moron, because I really don’t know why a man would welcome into his family a woman that has been devaluing his son, showing complete disrespect to his family. He’s supposed to caution this woman. No woman controls or dominates Chief Olusegun Obasanjo. The former President is a man of influence; don’t you think it’s hard to reconcile this with someone calling his son a poor man? Since your son is one of the many children Chief Obasanjo has, how come it’s only your son that is allegedly being treated this way? No, the other children cannot talk. 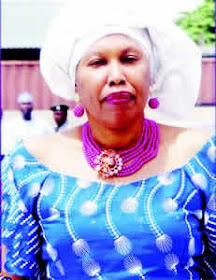 The real Obasanjo is the one Senator Iyabo Obasanjo wrote about in her letter. I’m just praying my son comes back. How do you feel that you were not at the wedding of your only son? I could not be happy that I didn’t attend the wedding of my first child and only son. It was a day I had been looking forward to. It is only if you are a witch as a mother that your son would be getting married and you would not be there. Apart from going to the police, what step are you taking to make sure he’s found? I’ve made the report to the relevant police authorities that they should help me to look for him. He’s running away from his father and he’s running away from his home. They should help me appeal to his father. The world should help me to appeal to daddy Obasanjo to fear God and know that he is not God. Help me to appeal to him. He cannot take one per cent of insult from a woman, so what is his reason, motive or agenda for insisting that his son should remain in a wedding of horror. He’s aware of these things. He should address this issue, instead of forming coalition. Are there times you cry over this incident? There was a day my ex-husband called me; one of the days my son went missing, and he asked me his whereabouts. I told him not to go there and he should rather look for my son. He said he learnt that I was hiding him and I told him I couldn’t hide him. I don’t even pray that my son would come and stay with me; that would be a curse. May God forbid it. I’m praying for him to go higher, have children and have a peaceful home. With the way you feel now, what would you advice him to do when he comes back? The choice is his. He’s old enough to decide. He defied the warnings of the Almighty God and that of his mother, so who am I to tell him what to do? Am I the one telling him to run now? No. But then when you went to court to stop the wedding, some people thought maybe there was something wrong with you. (Cuts in…) Yes, they thought I had mental problem. My twin brother came to court with five senior lawyers, SANs, because they thought I wasn’t okay, but they, including my son, who joined them, have all seen it now. My son has now seen what God was trying to prevent in his life. Now, he’s running from a marriage at this early stage. However, let this young man be brought out to speak independently, about what he’s going through. Is daddy Obasanjo not over 80, is he married to one woman? Why are you now forcing your son to stay in this kind of marriage? My son is a very reserved person. My daughter is married, so imagine me saying I must go on honeymoon with her. That is not done anywhere, but that happened in my son’s case. Then, subsequent happenings have demonstrated to this young man that he had to run for his life. He should not force death on my son and he should not destroy the destiny of my son on account of marriage. This marriage can result in loss of lives. How can somebody be running away from death and you are saying he should stay there? He has ill-treated this young man too much. That lady is trying to get him into trouble, because in trying to defend himself, she could be injured or even fall down. One day, it would get too much and instead of running away, he would react. He’s not a dunce. He’s a healthy young man and he’s not a moron. Are you very confident he ran for his life or there could be other reasons? Of course, he’s running for his life. Let them find him and allow him to talk, because they have turned him to a fugitive. My son should not become a fugitive on account of marriage. He should not be made to be running up and down like a common criminal. Chief Olusegun Obasanjo is the one the world should help me to appeal to. He’s the one that can bring solution to this situation. Now, we don’t know where he is, he’s homeless, he has no job where he is, yet he’s being threatened from left, right and centre. A father that is supposed to give support and protect him is saying he must stay in the same marriage. This is an age where women kill their husbands anyhow. I love him; he’s my son. He’s a gentleman anybody would love to have around. I don’t think it is a crime having a big man as a father. I think he’s afraid of the father, but marriage should not become a do or die. It is God and Chief Obasanjo that can help us to resolve it. Have you met the father of the wife, Sir Kensington Adebutu, about this? I even went with a delegation to see Chief Adebutu. He’s a good man. He said he was sorry and he didn’t know about it. He said he had just heard too. Daddy Kensington Adebutu is a noble and supportive father to all. He’s peaceful, very tolerant, humble, not hateful and he loves people. He is never tired of being of help to people. He’s not the type who delights in making life difficult for others. What was it like being married to a former President?